Celebrating 50 years since the consecration of Blackpool Chapter of Fellowship No 7692, companions congregated at Blackpool Masonic Hall and following the formal element of the convocation, wives, partners and friends joined the companions for an address from the principal guest, Assistant to the Provincial Grand Principals David Randerson, before retiring to the dining suite for a fine dinner and refreshments. Pictured left to right, are: Jim Finnegan, David Randerson, Philip Houldsworth and Tom Houldsworth. Commencing the formal proceedings, first principal of the chapter Philip Houldsworth, assisted by second principal Jim Finnegan and third principal Tom Houldsworth, opened the chapter with alacrity and zeal in readiness for the entrance of distinguished companions who were accompanying David Randerson. Notables on the impressive list of guests included grand officers Harry Cox, Peter Elmore and Geoffrey Pritchard, along with Chairman of Blackpool Group John Turpin and acting Provincial grand officers; Scribe Nehemiah David Barr, Provincial Deputy Grand Director of Ceremonies David Thomas, Provincial Grand Chaplain (Craft) Godfrey Hirst and Provincial Grand Steward Juan Topping. When the dignitaries had comfortably settled in their respective seats, first principal Philip introduced the most formal and imposing element of the ceremony, the rededication of the chapter by Godfrey Hirst who, with his inimitable passion and exuberance, provided a moving and poignant address. Godfrey Hirst in relaxed mood at the festive banquet. 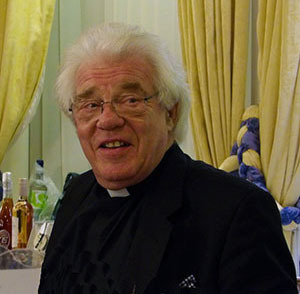 There followed another unique address by Godfrey, again with his characteristic zeal and panache; that of dedicating a new Volume of the Sacred Law to the chapter, in memory of Peter Shield who had been first principal of the chapter in 2008 and 2009. The ceremonial Royal Arch rededication ritual duly completed; the wives, partners and friends of the companions were invited to join the multitude and receive a celebratory presentation from Assistant to the Provincial Grand Principals David Randerson. Warmly welcoming the visiting throng, Philip introduced David and sat back to savour his presentation. David, in turn and in relaxed and convivial mood, welcomed the party and proceeded to offer a précis of the history of the chapter. Blackpool Chapter of Fellowship No 7692 was consecrated at 3.45 pm on Thursday 16 November 1967 at the Masonic Hall, Garden Street, St Annes on Sea, at which the consecrating officer, Second Grand Principal in Charge, was Past Grand Treasurer G Ward Platt, assisted by installing principal H Hamlet and accompanied by a host of Provincial officers and the Provincial choir. Duly installed in their respective offices were first principal H Nuttall, second principal I Burgess and third principal W E Baxter, all of whom were Provincial officers. The first regular convocation of the chapter took place on Friday 5 January 1968 at the Imperial Hotel, Blackpool and within its busy schedule managed to ballot for five new members and exalt two of those present. This healthy start to the growth of the chapter continued during the first decade of its existence with 27 brethren exalted, with five double ceremonies. Pictured from left to right, are: David Thomas, Harry Cox, David Barr, Jim Finnegan, Juan Topping, David Randerson, Philip Houldsworth, Tom Houldsworth, Peter Elomore, Geoffrey Pritchard and John Turpin. Between consecration and 1973, with the exception of installations and two lectures, there was at least one exaltation ceremony per meeting. During the first decade there were also five joining members and three members were made honorary members. 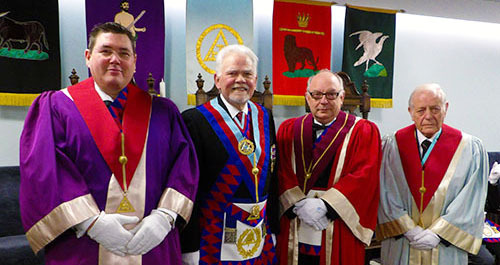 The run up to the 25th anniversary of the chapter saw the membership grow with a steady stream of brethren being exalted – with 46 exaltees over the 15 years, including seven double ceremonies. During those 15 years, the membership also increased by 10 joining members. In the 25 year period approaching its golden anniversary, the chapter has exalted a further 45 candidates with an exaltation at every regular meeting between the years of 1993 to 2000, with 1995 seeing six brethren exalted at its three regular meetings. As with the majority of lodges and chapters however, a slight decline in numbers has been seen since 2002. Lively conversation was in abundance at the festive banquet. The chapter continued to meet at the Imperial Hotel until 2003 when a special meeting of its members decided that it would move to the Masonic Hall, Adelaide Street. And there it has remained since. Enlightened and entertained by David’s presentation, the throng retired to the dining suite to experience an informal, relaxed and jovial dinner where fun and enjoyment was the order of the day. To an outside observer, the dining room appeared full and on very cordial terms with itself. Everybody seemed to know everybody and conversation was proceeding in the liveliest manner. It was a perfect closure to a very happy celebration. David Randerson (centre) with the companions of Blackpool Chapter of Fellowship.